Adjika is a hot, spicy but subtly flavoured paste often used to flavour food in Georgia and in Abkhazia. It is based on a boiled preparation of hot red peppers, garlic, and herbs and spices such as coriander, dill, blue fenugreek (which is only found in mountain regions such as the Alps or the Caucasus), and wallnut in the Abkhazian variant. It also exists in a dry form. This looks like small red clumps mixed with a looser version of the spice. It is said to be either a Mingrelian, or an Abkhazian recipe. It is usually red, though green adjika can be made with unripe peppers. In appearance and consistency adjika resembles Italian red-pesto. The spiciness varies from recipe to recipe; those acquainted with British-Asian curry styles would probably rate a typical adjika as 'vindaloo strength'. Home-made adjika is available from many market stalls in the Caucasus and in the Krasnodar Krai of Russia. 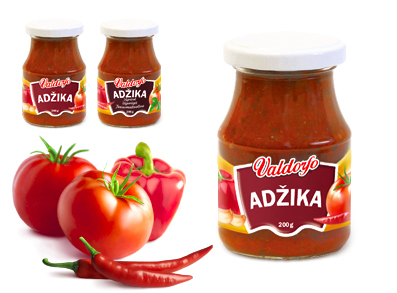 Different versions of adjika, sometimes having tomatoes as main ingredient, are produced on commercial scale and sold in supermarkets in Ukraine and Russia. Tomatoes are not an ingredient of traditional adjika.